Han Solo Frozen In Carbonite Desk | OhGizmo! Say what you will about George Lucas and his merchandising empire, but I have to give them credit for realizing how important their fans are and not always having a knee-jerk lawsuit reaction to every single Star Wars homage. 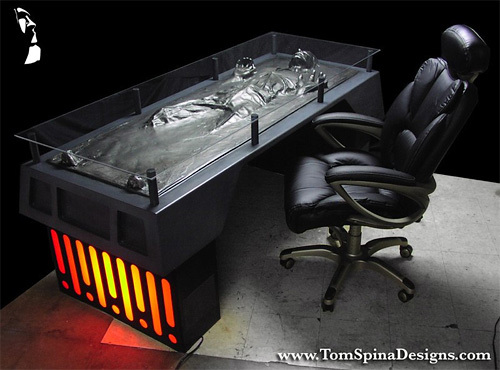 Like this custom ‘Han Solo frozen in carbonite’ desk created by Tom Spina Designs. While there’s not a terrible amount of information on their site about it, I’m pretty sure it’s not an officially licensed Star Wars product since it was actually created as a custom one-off design for one of their clients. Oh and FYI, while it’s a nice design and all, I’m not a fan of glass top desks because there’s always the chance of this happening. Tell me something I don't already know. I saw this last year. If this weren't so old it's be new. This thing is….OK, I'm out of ideas. A very cool piece but VERY old news. I kind of agree with mcman, I saw it a long time ago, but I never knew the back story. Thank you for filling in the gaps.